Ecomodernism: creating more questions than it answers – One Billion Hungry: Can We Feed the World? Technology has, over history, reduced our reliance on natural ecosystems (or at least their directly obtained goods) and increased our resource-use efficiency but it has also allowed the human population, and associated consumption, to expand exponentially as well as increase the reach of society’s impact on global ecosystems. Although our consumption patterns are changing (in developing countries diets are shifting to include more meat and processed foods, while in some developed countries more sustainable protein sources are growing in popularity) and human population is predicted to peak and decline this century, globalisation and the distance between societies and the resources they consume, continues to increase. The development of technological substitutes could lower the impact our lifestyles have on ecosystems far away. Technological development supported by the report include urbanisation, nuclear power, agricultural intensification, aquaculture and desalination. On the other hand suburbanisation, low-yield farming and some forms of renewable energy production are believed to increase human demands on the environment. In reading the manifesto one is almost convinced by their optimism and wealth of experience but it also comes across as naïve. They acknowledge that intensification in the past has brought about wide environmental degradation yet give no solutions to overcoming this. Many technologies have had disastrous unintended consequences such as pesticides yet what are the alternatives if we are to increase productivity? They state that “increasing agricultural yields can reduce the conversion of forests and grasslands to farms” and yet provide very little evidence in support. Indeed they fail to address instances where intensification and higher agricultural yields have brought about increased conversion of natural lands to farming rather than so-called land sparing, for example as seen in South America. They also claim their manifesto will reduce global poverty but provide little evidence this is a likely outcome. Indeed intensification may not be possible for many, particularly the poorest farmers and foresters who lack access to the inputs, finance and tools required for intensification. If only available to all but the poorest then intensification threatens to increase wealth inequality. These impacts are not discussed at all in the publication. In fact much of what is written is focused on the developed world yet much of the wilderness we seek to lose in the coming decades as well as habitats important for a vast array of biodiversity are in developing countries. Where more intact ecosystems exist there are often communities reliant upon them. As the report acknowledges there is no way to define what nature, wilderness or naturalness is and thus conserving it is difficult. Authors do explain the importance of emotional connections and spirituality in motivating our desire to protect wild nature and landscapes, and thus the importance of social movement and politics in pursuing an Ecomodernist agenda. Yet will the separation of nature and human society inspire appreciation for the natural world or a decline in understanding of its importance? While these questions have yet to be answered, the Manifesto has inspired much discussion. Now in a new report, Nature Unbound: Decoupling for Conservation, the Breakthrough Institute expand on the themes laid out in the Ecomodernist Manifesto, yet do not address the multiple failings of the Manifesto. The report begins by outlining how some of the environmental impacts we as humans have on the planet are declining on a per capita basis for example water consumption. This is good news if the population also decreases, and while it is predicted to fall this century, this decline may come too late to, for example, mitigate climate change. So at least for the present many of the impacts we have on the environment are growing. And the least decoupled environmental impact is greenhouse gas emissions from energy, which grew almost 40% between 1965 and 2013. The report goes into more detail about the way substitutes can aid the decoupling process. Aquaculture, for example, can help to take pressure off wild fish stocks. Using synthetic fertiliser instead of organic removes the need to apportion land for nitrogen fixation. Again authors advocate intensification as a way of reducing our footprint on land but fail to acknowledge the growing sustainable intensification agenda that supports the same end result but with less potentially damaging environmental and social impact. The only concession to these environmental impacts is that less polluting energy sources need to be used to reduce the impact agricultural intensification and tools such as fertilisers, pesticides, machinery and irrigation, on climate change and air pollution. The most positive message of the both the report and manifesto is their support for technological innovation. While many may disagree with the publications’ content there is no doubt that they have inspired debate and discussion. 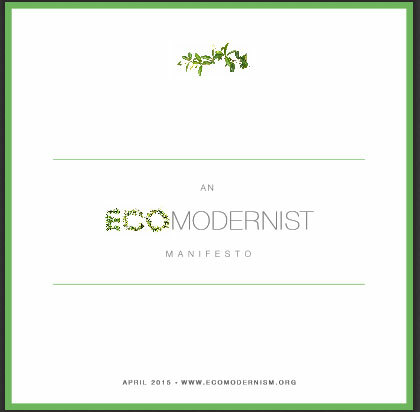 Below is a list of some critiques and reviews of the Ecomodernist Manifesto.